The New Year is here! The beginning of the year is usually the time when we make plans for the future. Away from the sparkle of the holidays past. In January, we promise ourselves that we will be better. That we will do better this year. For that, we often turn to healthy food. To go with our resolutions. But we also need comfort food. After all, New Year’s resolutions can be challenging. Good grains and pulses are what comes to mind when we think of good, comfort food. Today, we’ve selected for you a very interesting recipe. Leeks, sweet potatoes, and lentils all come together for a unique take on the (let’s be honest), sometimes boring lentil stew. This warm and hearty soup is the perfect accompaniment for your new years resolution planning. And a tip for you: When serving, drizzle some aged balsamic vinegar on top. It makes all the difference in the world. Peel the sweet potatoes and cut them in small cubes. Finely slice the leek. In a large saucepan, and over medium heat, pour the olive oil. Add the leaks and stir until soft and slightly caramelised. Add the garlic, sweet potatoes and lentils and still until covered in oil and well mixed. Add the vegetable stock. Season with salt and pepper and add the herbs (if using). Bring to the boil, then lower the heat and simmer until lentils are cooked through, adding more liquid if needed. Serve with a drizzle of balsamic vinegar and fresh parsley. 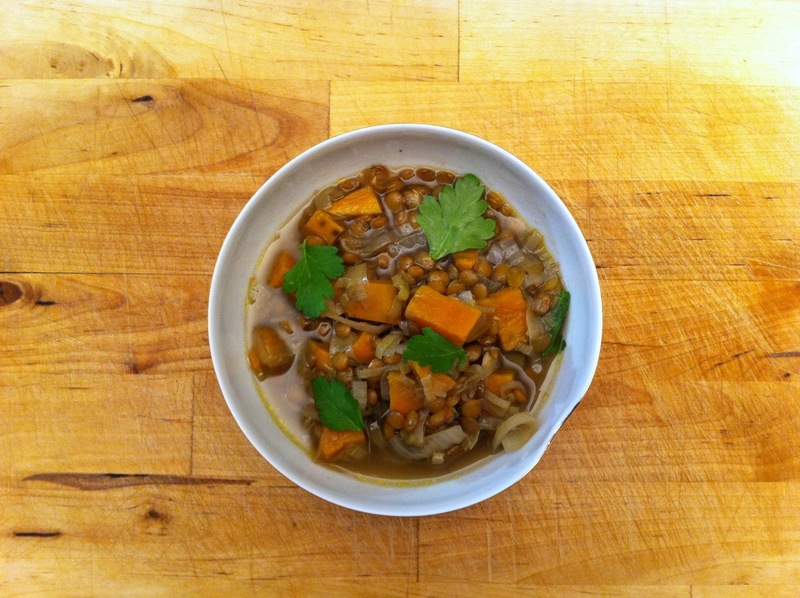 This entry was posted in Recipes and tagged lentils, pulses, vegan.